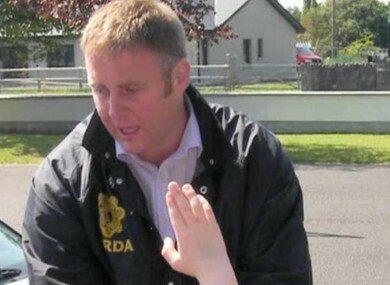 THE SHOOTING DEAD of Garda Detective Adrian Donohoe at a credit union north of Dundalk in Co Louth last night has left the local community in a state of shock. Detective Donohoe was described as a “fine, fine fella” by colleagues as local councillors condemned the shooting at the Lordship Credit Union at around 9.30pm last night and said that the community in Jenkinstown was in shock. Gardaí said this morning there had been no arrests at this stage and an investigation is ongoing. A press conference may be held later today. Donohoe was a father-of-two who lived less than a mile away from where the shooting happened. He was stationed at Dundalk Garda Station. Gardai man a checkpoint near the scene last night. Pic: Julien Behal. In a joint statement, Sinn Féin councillors Jim Loughran and Edel Corrigan said: “This is a close knit community where everybody knows each other. This Garda was admired, trusted and respected by all in the locality. Loughran, who knew Donohoe through the local GAA club, St Patrick’s, condemned those responsible saying they had “attacked a community and must be apprehended”. The credit union stayed open late on a Friday evening and it is believed that staff were locking up when the attempted robbery took place and the shooting happened. Donohoe was with a colleague who is said to be extremely traumatised but otherwise unharmed from the incident. Gardaí say that four people fled the scene, travelling towards Dundalk in a dark coloured car. The President of the Irish League of Credit Unions (ILCU) Jimmy Johnstone extended his sympathies to the family and those affected by the shooting saying that the ILCU would provide counselling to those involved n the incident. “We are not in a position to comment any further at this time as we are co-operating with the Garda investigation,” he added. Email “Community shocked after shooting dead of 'respected' Garda detective”. Feedback on “Community shocked after shooting dead of 'respected' Garda detective”.